U.S. President Barack Obama displayed his talent for Newspeak oratory when announcing his second proposed budget for the United States federal government’s 2012 fiscal year on 18 April 2011. Last week, President Barack Obama’ proposal on long-term deficits demands spending cuts and tax increases in 2014, if the federal government does not reach its debt-cutting targets. “If, by 2014, our debt is not projected to fall as a share of the economy — if we haven’t hit our targets, if Congress has failed to act — then my plan will require us to come together and make up the additional savings with more spending cuts and more spending reductions in the tax code,” he said. So, what exactly does President Obama mean when he calls for “spending reductions in the tax code”? To get straight to the bottom line, what he proposes to do is to significantly increase the federal income taxes that productive Americans are required to pay without having to go to the trouble of increasing income tax rates. Instead, the President is seeking to hike federal income taxes by reducing the amount of deductions and tax credits that honest Americans can claim on their tax returns. But because he doesn’t want to appear to be raising federal income taxes, he’s using some really deceptive language. 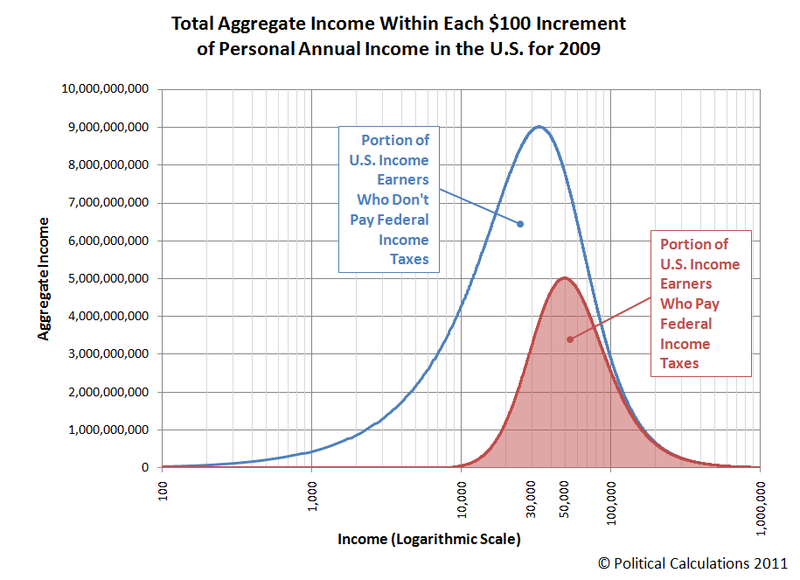 Theoretically, all the area under the blue total aggregate income curve is subject to federal income taxes. In practice, deductions and tax credits exempt large portions of low-to-middle income earners from the burden of paying federal income taxes. The Tax Policy Center estimates that 47% of all income earners in 2009 either paid no federal income taxes or received back more from the federal government than what they would have had to pay, if not for the deductions and tax credits they could legitimately claim. You can see how twisted the President’s ambition to increase federal income taxes is if you consider that all of those deductions and tax credits are related to things that the federal government wants to encourage among Americans. Things like home ownership (via the mortgage interest deduction), higher education (through education tax credits) and having children (unsurprisingly, the child tax credit). Finally, please consider one last thing. Much of the President’s rhetoric focuses on getting more from people at the highest end of the income spectrum. As you can see in our chart above, these are the people who already have the least amount of avoidance in escaping having to pay federal income taxes, which we see in the minimal white space above these high income levels. The biggest potential gains for the federal government’s tax collections are to be had by going after the where the amount of white space in the chart is the greatest, and that’s at the lowest end of the income spectrum. Eventually, when they can’t get enough from the top end of income earners, they’re going to have to go after where the gains (from their perspective) are to be had. So where does your personal income fall on that scale?